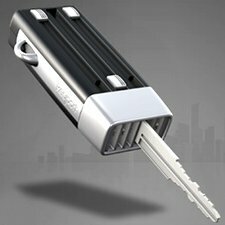 Dubbed the ‘KeyPort Six-module Slide’, this gadget proclaims to be the ‘World’s First Universal Key Fob’. ‘Universal’ means that it includes a RFID function and a car alarm remote function too. As these two features are ‘currently under development’ it’s still impossible to tell how many RFID codes it will be able to store and how easy or practical it will be to switch between them. Also, we don’t know if one device will be able to store remote commands for more than one car, or if it can also work as a garage remote. For the normal keys, the only downside is the fact you’ll have to go and make copies of your existing keys to KeyPort compatible blanks that can be fitted inside the shell. The eye hook is offered as a ‘feature’, but i really think it needs better placement, so you can connect more of them together. There’s just too many of us who have more than 6 keys. All in all, even without the RFID and remote functionality, the KeyPort is a good solution to cluttered and clinking pockets or bags. You can sign up for a future purchase here, found at Core77. Very cool idea for normal locks – doors, bicycles, garden sheds etc. You’d still have to keep the original car key though given that most modern car keys are designed not to be (easily) copyable and are embedded in a lump of plastic and electronics for the immobiliser and alarm. That could be what you use the eye hook for – attaching the car key to! Don’t forget you also need a copy of your car key to give to the mechanic while he’s fixing the car, I guess that’s where the original comes in handy. As far as using more than one of these to hold more than 6 keys, I would think it would get pretty difficult to remember which key was where on the device. It doesn’t look like you can identify each slot in any way.